Lately I’ve been listening to some of the review panels that Artcritical sponsors at the National Academy in New York. Even though I am not able to see the shows they discuss, I find the panels pretty damn good. One of the critics on a recent panel was Charlie Finch, who I have mentioned here before. I have followed his writing for quite awhile - he has a definite slant, which comes off very convincing, even when you do not agree with him. I’m looking forward to talking to some of these people when this new radio venture gets going. It will commence in about a month from now. One month ago I played my last show on KPSU. It was the most anticlimactic show, leaving as quietly as my very first came (in which Tom Cramer and I rambled on so much that someone called up and asked: “Just what kind of show is this?”). The last show revealed how ready I was to leave and how ready the world was too. Most of Artstar must have been driven by our desperation for any kind of art coverage and most importantly, the power and popularity of various guests. I played music in the cold sub-basement a final time. Even my fellow DJs, passing through, had forgotten I was leaving. I played the entire Pink Flag by Wire, which has plenty of unplayable violations. But no one cared since no one listened. I never even told anyone about the anticlimactic final day, but it surely served some kind of purpose. Over the weekend I received a small and juicy little black book called One Shot. The project Visual Codec commenced last year, a collection of artworks amassed from the Pacific Northwest, is finally out. As I was one of the judges, I had seen all of these images before. Still, some seemed like new when viewed in this format. No longer on the computer screen (we viewed from secret spots online), the images feel more validated and ‘real’ in the book form. They also just seem to look better; don’t know why this is. No names were included in the jury viewing, no gallery affiliations, no resumes or statements. Sometimes one could recognize the work, but I was surprised at how much I just had to use my eyes - because I did not recognize. For some, I know this makes them feel uncertain, but I don’t mind the feeling. After the looking comes the liking (or not). Without the outside input, you get to ask yourself if you like the work and then, even if you don’t, is that bad? Sometimes ‘not liking’ is good. It kind of goes back to that whole ‘quality of work’ issue – it’s a subjective verdict in my book. Every viewer brings their stuff with them. - And yet we had to be also instantaneous in a way too, trust your gut. I recall m saying something like "..if you want to keep scrolling, rate the work accordingly..." That idea was kind of liberating. The winners of the one thousand dollar cash prize at One Shot was Lead Pencil Studio for the Maryhill Double (see image above). Thanks to m of VC taking on this project. 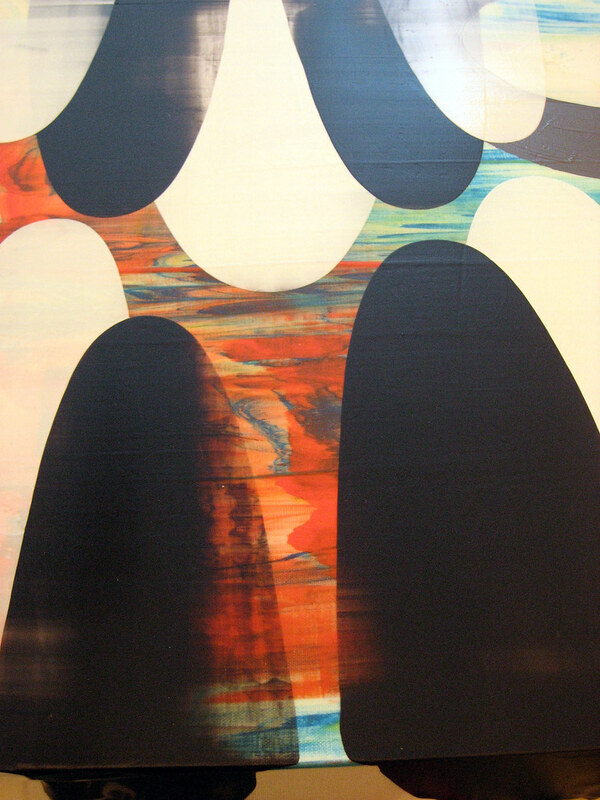 In June Chambers will show digital works by Chris Ashley of the Look, See fame. He calls these works HTML drawings. It's not like I know every artist working in this medium, but Chris Ashley has got to be one of the best. Day after day, in his website, he knocks me out. I’ll never forget the day I discovered it. I ooooed and ahhhed and knew there was so much I still had to uncover within the site. The very precise line made with the click of a mouse must go far, very far, to impress. Chris does. You can tell he’s a painter. One project he did previously was 365 – a drawing for everyday of the year, installed in a linear fashion. Chambers will show these works, plus others. The entire show will be called WYSIWYG. I feel like Chris and I have a few things in common, even though the method is different and well, so are the results. But we both find a great deal of freedom working within a defined system. And we’ve both got that z i n g.
Also, in his statement, he says: Although the images I make are typically “abstract” they often reference and allude to the real world. Like Chris, I feel I paint my reality. For me it’s all somehow landscape-based, but I am using that word very loosely, as far as can be stretched. I think he is too. For this term I am taking a writing-intensive course at PSU. I am surprised at how much of my word-juice is already zapped from the class and it’s possible I won’t be posting as much. 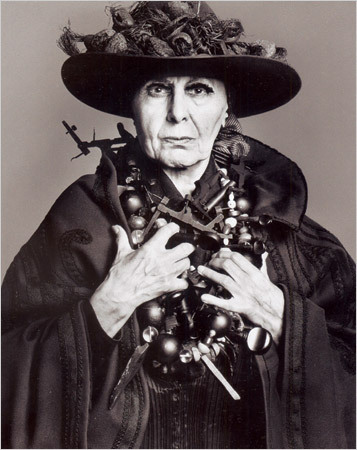 Over the weekend I read an interesting profile by Leslie Camri in the Times on the persona and style of Louise Nevelson. No doubt this has all been tackled before, but this whole issue of how-she-looked vs. what-she-made has only been on my mind for the past few years. This is because I am often the Object within my art career and even in my own exhibitions and like Nevelson, some of this is probably my own doing. Not that I was looking at it that way at all; too naïve and embracive to be so calculating as Nevelson, who is written as one who knew just what she was building – a legend and nothing less. But as the article reminds us, she paid a long-term price for it by not being taken all that seriously. Once she was finally shown, it was with the guys half her age. But everyone was too busy looking at her - I know I was! I have childhood memories from the 1960s, seeing some spread on her – probably Life Magazine. You see, what is strange for me now, thinking of all of this, is that I know today how incredible her work is. Even the piece right here in the Portland Art Museum is good. It’s taken me all of these years to get over her and look at what she accomplished. This article points out that artists for many years had personal style. Camri covers the gamut from Duchamp and Picasso to Kahlo and O’Keeffe. Artists were allowed their eccentricities, the writer seems to think, but these days we are way too involved in our careering to wage personal or eccentric veneer. The headline goes something like Can an Artist Still Look Like One? Simpleposie recently asked if one ever had works ‘under exhibited’. I am not sure if they are ‘under exhibited,’ but I certainly have works never shown. I still make them. I am actually surprised at how often artists think that everything they make must show. Not to say it isn’t worth it, because the reaction from someone else’s eyes can change everything. But that's not the only thing, maybe not even the main thing. I think it’s good to make just for you. Maybe it’s all that doodling I did in math class. If you really like to dance, you need no partner and certainly no audience. And if you do it enough, you get good at dancing, develop your own special moves. But you may never develop the really crazy special moves without that private dancing. In these days of ‘bodies of work,’ most of that gets shown. But I still like making the one-off, the stuff that just gets made and maybe goes nowhere. Of course I couldn’t keep everything. A lot of paintings, especially in New York, went out on the streets. They disappeared quickly though. Brad Stone of the New York Times has made a call for civility on the Internet, asking for a code of conduct. Some think it’s coming too late but others are saying that things like libel - are libel, and that it is never too late for some manners. You can find more information on this code in Wikia and Tim O’Reilly’s Radar. The Style section of the Times on Sunday had what I consider a related piece - The Rise of the Takedown. This article considers how Internet bitching is a form of heckling and that heckling is on the rise – in all places. It is the heckler’s hour. Everyone has a voice and everyone is a star – therefore no one is above aggression. And sometimes the aggression is the point of it all. I agree that there seems to be a certain anonymity when you write online, even if your name is attached. People write things they will not actually say. I’ve even heard of ingratiating meetings at openings, with all kinds of oozing warmth thrown about and plenty of time to do it in, all of it to result later in a really negative response to the show online. The negative response doesn’t alarm me so much as the almost (or outright?) calculation of it. ... But then, who actually talks about the work at an opening, right? The second code of ethics is “We won’t say anything online that we wouldn’t say in person.” That’s a tough bill to fill! Code number five asks for no anonymous notes. The only reason I wanted anonymous notes here is just because it’s easier than signing in sometimes and I would never change that unless I absolutely had to. People should own their words but sometimes you just want to talk. For the most part, I understand. What a character. That face. If you look at the coat by his ears, you will see he still has some puppy fur left – just those wisps, which I pull into hair-bows sometimes to tease him. We’ve been going to Sauvie Island and he’s clearly a water-dog. I’m with Anna Wintour (as commented upon by Jen Bekman at Personism): I was never wild about the word ‘blog.’ Carolyn Zick and I talked about the word quite a bit when she came on the air. I held on to the word (and the practice of) ‘diary’ for many reasons, but just the sound of the word was one of them. Another major reason: it’s something I did longer than most, now in my 134th notebook and 38th year, and so I felt a certain ownership. Ownership feels good. When I saw all these various online journals and then blogs exploding, I cheered on in one way (for I certainly read a lot of them) while I was strangely alienated in another. I guess this is because I loved to write in a way that I do not see often out there. But does that matter? Probably not. Over the years, pals began journals after finding out about mine. Then they reveled in the practice – but few kept at it. It has its own rigor. Even the attitude towards my own online journaling changed over time as more people embraced it by following suite. One person told me they did not like reading my writings in Lovelake - it felt invasive I guess (though they never said why). But guess what? They keep a blog now! Some people really detest blogs, refuse to read them (no matter who is writing them) and feel the blog gives credence to those whose opinions are not very carefully considered. Actually, I’m OK with all of that, because I saw the reverse for so long: same opinion at you, all the time, same lone critic/ reporter and paper or magazine, forming the taste of a town and their opinions are not always without bias (or with education) anyway. The digital age is transforming everything. Just to hear Phil Bard talk about what an exciting time we were in for photography, all due to the digital format, made me rethink the art of the journal. Photography may have been ever-changing since its conception, but the diary has been pretty much the same for hundreds of years - until now. And all along, I read historical journals. No wonder I get so unnerved sometimes – by what is written by others online and also by what I try to share. After all, I still have the beloved personal, private practice in paper, where I can tell it all. They said that the Internet would make the world smaller, but I found that it also made your own backyard so much more accessible and somehow more important. Entire events are driven by an email or a blog. But I could only keep up on what everyone was saying for so long! Stepping back will also be stepping forward, as I arrange a way, via the radio, to talk to those not in my backyard. Mail art often revealed this romantic idea of the artist – that one is different, committed, might suffer for art, might live for it. Often these people were behind the Iron Curtain (like Thomas Schulz above) and they did not have a gallery system for the kind of art they liked (not just collage, but most of the modern movements and ideas). Their way to view and share was to mail it out. This is probably why I got more mail from East Germany, Hungary, Poland and the like than anywhere else, but I got it from all over. Leonard Frank Duch (below) was from Brazil. That minimalism/ postminimalism show at the Portland Art Museum makes a powerful case for the print. The stretch of Richard Tuttles was particularly impressive, as was also the gushing Ellsworth Kelly. As Jordan Schnitzer, the collector who brought these pieces together over time said: “I was able to be in Ellsworth Kelly’s studio… and everything was to die for…” (that’s loosely quoted) – yeah, well I would feel the same in Kelly’s studio: to die for. Jordan’s speech at the museum was so heartfelt; you could not doubt his enthusiasm. The curator Annette Dixon gave a few high notes in her own delivery but my mind sort of drifted at the very beginning, happy to stay there, when she spoke of Josef Albers as the beacon. Albers has been a life force for me before I even encountered Malevich. As she detailed his importance, my mind went to my own Albers print (above). When you first hit this exhibition, you see a whole wall of Albers right from the same press I got mine. In my own painting, I’ve gone over yellow and blue a la Albers and know how infinite the possibilities are. This small place right downtown held a ménage of the found and the weird and I could tell that Lex and I had tastes in common. He also did mail art, loved Dada and all things found thereafter. He made so much propaganda and you can still find him today with art booths on the street, most notably in the NW. He paints too. He gave me this Kmart Cat when I interviewed him on Artstar. John Perreault has an interesting idea as to how to respond to the galleries and museums filled with art mostly made by men: boycott them for a day. Do a general strike. This strike, by the way, is one the women must do. He says we are the ones who work much of the system, support it, buy the art, works the offices, write the press releases. Bail for a day. If a really big statement could be driven home, I am all for it. But part of me feels like what would happen would be just this collective sigh of relief streaming from elsewhere and I just don’t want to hear that sigh again. Women have to keep at it, no matter how oft-humiliating. And yeah, it is. In my own life I have had a million subtle and not-so-subtle hints to back down or bail out- some ongoing upset with every new project, the 70s, the 80s, today. I guess the ‘noise’ we were to produce was a theory, not an action. When I came back to Oregon, I was invisible enough, the 40 year old female artist. I could see right away how much more comfortable I made a whole tide of people feel (because I had something to compare it to: my past). I was right where they wanted me to be, bailed. I started Lovelake and Artstar as a way to make noise, even if my paintings couldn’t (they’ve been coming ‘round lately though). Even when I announced my leaving Chambers, some assumed I would disappear into my studio and stop the insanity. Better for my health you see. I think they were well meaning, but my studio sees enough of me and it’s just not the only place I want to be. Not on your life; not even on mine. People feel various responsibilities in their lives. We know what they are. A site I like to check in on is PaintersNYC. If you think the bitchiness is a little too much, welcome to a driving force in the art world (especially out east). I don’t think the site exaggerates the tenor one bit. In fact one of the most toxic yet valuable aspects of blogging is that it brings all the voices in – in perhaps an unedited fashion – but those voices were always there. I can vouch for that. Otherwise people are polite alright. Yet I am still amused at how the pecking order is constantly re-measured and evaluated, like a required dance in which one must ascertain your place, or at least put you in it. It’s coming back as I now arrange my next project. I remember it clearly, the dance, from my days in NYC. Everyone pays tremendous dues, is reminded of their place (and there’s always a better place, non?). After awhile, you can do it too, as some sort of self-defense mechanism. Actually, I didn’t. Still again like the embracive goof wanting a gig with the Pistols, I know I did not return back to Oregon with it all intact but it must be back – you just don’t realize it until you’re head to head, and then it all kind of seeps out when you did not expect it. But it does not feel bad this time around. I was made aware of my measurement at every art party I went to in my 30s. Down, girl. What about this and what about that and you did not pronounce that right. But at 50, it’s just different. OK, I did not say it right, but they’re still calling me back. And I know now that the pain and humiliation is their own – that’s why it’s out there. You know, spread the love. No need to take it personally. And of course it’s not just there either. I found it here in PDX too.